Relativity isn’t confined to Einstein. It applies in the art world, too. 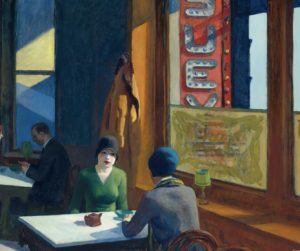 Most recent example: the Christie’s auction sale last week of “Chop Suey,” the Edward Hopper 1929 painting, which hit a record at $91,875,000. The famed American realist artist netted $1,000 or less from his agent, the Rehn Gallery. Relativity. Most famous artists have to be gone from this void before their pieces are worth a fortune. Hopper never took in more than about $8,000 for any of his works, living well enough though frugally in his Washington Square, Manhattan, rental until his 1967 passing. Even the locale for “Chop Suey,” an upstairs Chinese restaurant, suggests living on a budget. Such places, in Hopper’s time all over Manhattan and usually on the second floor or in the basement for cheaper rent, offered inexpensive, satisfying food, with wonderful tea in sage-green cups that had no handles. Hopper and his wife, artist Jo Nivison, would walk to these eateries. When he returned to his Nyack, N.Y., birthplace, they went to the upstairs Chinese restaurant off North Broadway. A look at “Chop Suey” shows two women, neither of which have smart phones, instead having what seems to be pleasant, face-to-face conversation. The meal appears over, since there is only a teapot and a bowl that may have held nuts. A man and woman are at a rear table, she smiling, he looking down. Outside is the iconic neon sign, and in one window is an abstract design, perhaps Hopper’s reference to the then current painting style. What does “Chop Suey” say? That depends on what you see, what the artist meant or was looking for. For me, it’s relativity, the state of being relative to the period, the moment. Edward Hopper would probably be offended by the auction price, by today’s greed art market, with investors and the one percenters largely unappreciative of what he was searching for in “Chop Suey.” His currency was his interpretation of his innermost feelings and observations. That is what we see in the Hopper works, whether they cost $1,000 or $91,875,00. “His currency was his interpretation of his innermost feelings and observations.” Well put. That’s what keeps millions of people coming back to Hopper year after year. Wonderful column Arthur!